File contains photos and journal by George A. McCubbin of the Belleville flood of 1936, along with reports, notes, graphs of weather patterns and maps. File contains c.1936 newspaper clips on the Belleville parasitic lab breeding new insects to fight off other insects that are destructive to farms and forests. File contains newspaper clips on on the March 3rd, 1904 flooding on the west bank of Moira, near the footbridge. 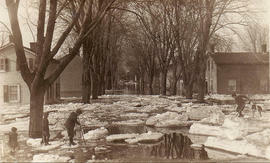 File contains newspaper clips on the January 8th, 1886 flooding of the Moira River that resulted from ice breaking away from the Grand Trunk Bridge to pile up and block the river at the Upper Bridge of the Moira River. 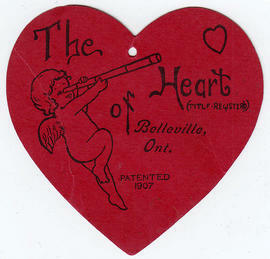 File contains newspaper clippings regarding water pollution in Belleville, including a new sewage disposal plant, an algae problem, and scientist including Belleville in a study linking water pollution to heart disease. File contains 2 newspaper clippings from the 1950's about the Early History of Moira Valley Conservation Report. File contains a newspaper clipping featuring Maurice Callaghan and his 60 years in the business of ice harvesting. File contains articles from a magazine regarding big game animals in Canada. File contains a newspaper clipping about the reforestation of the Corby Distillery farm. File contains correspondence about a circle of trees planted northeast of the intersection of West Bridge St. and Palmer Road in Belleville, and the possible origins of these trees. File contains newspaper clippings about the establishment of the Crowe Valley Conservation Authority and a booklet that compiles the annual reports from 1958-1965. File contains letters to the Government regarding timber cutting and forest fires from E.W. Rathbum of Rathbun Co.